Yes I did it, with almost the same team except my IG-88 is G12. I've put my best speed mods, and I tried to manage the healing with Bossk leader skill (by inflicting malus to adversaries). I'm running ZzBossk(L, G12), ZBoba(G12), ZGreedo(G12), ZIG88(one mod short of G12), Zam (G11). All aside from Zam have serious focus on speed mods with ratings as follows: 225, 226, 201, 209, 165. I do not come REMOTELY close to beating this challenge. The relevation of EA's most insidious and evil intent on this event is that (I assume) you need Jango's speed boost leadership to have any prayer of beating the ridiculously quick rebels. Which means you have to spend serious money to get Jango to 7* just to compete since they were so gracious to release him as a Marquee. Though he is not officially listed in their corporate directory, I suspect Lex Luthor is thriving in the ranks of EA's upper management. Sobering experience so far. Hundreds of dollars for Jango and gear didnt make a difference. 4 G12 toons, my best mods ... nothing. I just get wiped out in T7. Jango lead works better than Bossk lead but it is impossible to trigger the contracts. With Bossk lead I managed to trigger contracts but they just one-shot me immediately afterwards. I am completely out of ideas. Kill Chewy first and hope for good RNG to allow you to do it. LoneCat - no offence but I don't believe you. 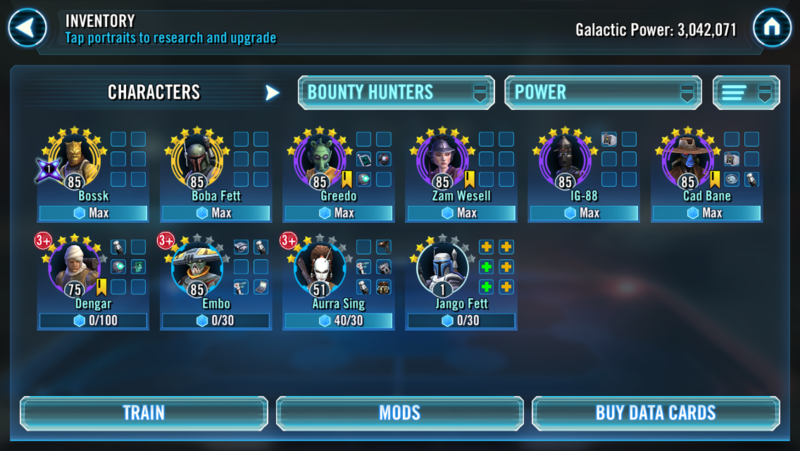 Can you put up a screenshot or link to your SWGOH? I can kill Chewie first. But that is not enough. Al least it looks funny how all my BH get kicked off the screen within seconds. I did it with g12 bossk zeta lead, boba g12 zeta, zam g11, cad g11, dengar g9. Took 40 tries. Don’t get discouraged just keep going at it. I was where you were at and then all of a sudden I was able to beat it. It’s a female dog of an event but it can be done through the grace of rngeezus. The gear level should be enough, but they are too slow. Congrats LoneCat. I had to make them much faster to be able to beat it. Without dengar it is impossible. He is the key, not as leader, as member of the team. I was able to beat it with Zbossk L, dengar, boba, ig88, and greedo. All g12 had to put my arena mods on and it still took about 15 tries. Some of them have some of the g12 pieces but no g12+. No zetas besides bossk lead. You are one lucky person!! Congrats! Since they said we could use any 5 this cant be true. Of course "any 5" does not mean you have good strategy options. Boba (L), cad, greedo, ig88, dengar, all G12, no zeta, trash mods (most of them are blue grade with fastest is +68 speed for greedo). 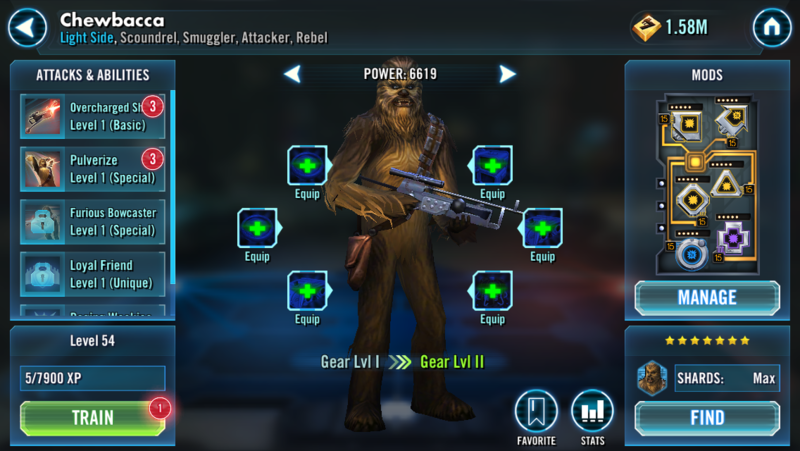 got my 7* chewie. zzBossk (l), zBobba, zGreedo, zDengar and Cad Bane. All g12 except Cad who is g10. Luck is mandatory. If R2 lands the smoke screen, good bye. Then, focus on Chewie. Execute him, stun him and throw Bossk's net to him for the assists. Termal detonators, to recover health and protection. 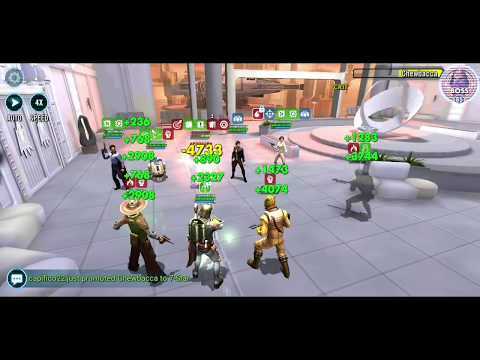 After you finish him, buffs from both Leia and Han wil be gone. After that I went for Lando, Han and Leia. R2 was the last one. Hey, quite easy after all, isn't it ? any other advice? what about potency mods or so? g12? g12+3? g12+5? 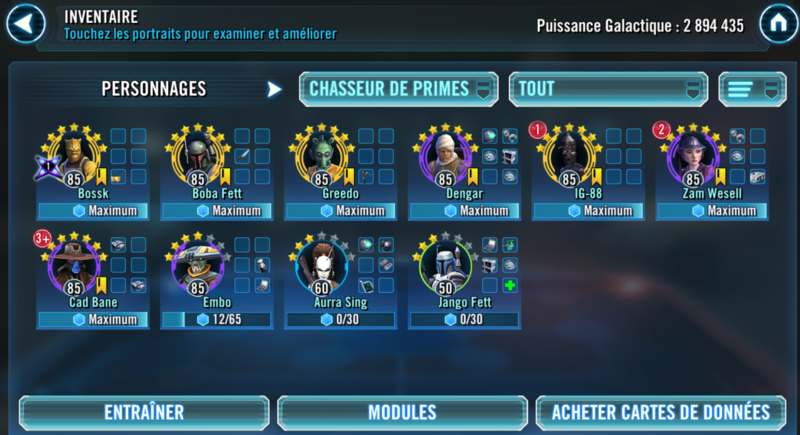 do you have a swgoh-account? can we have a look into your team? 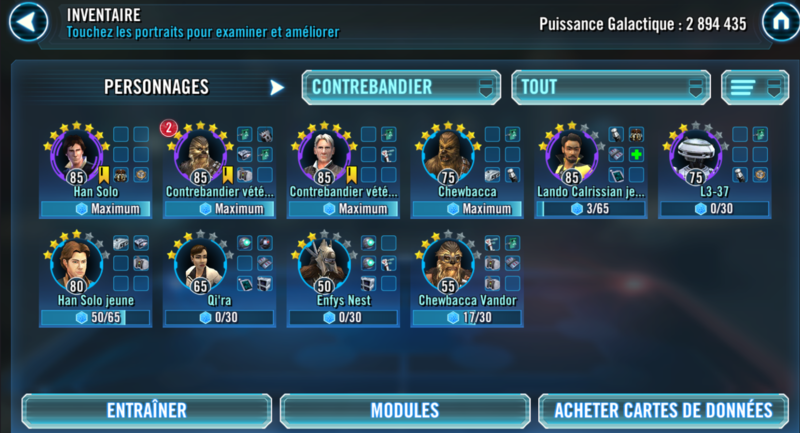 Screw CG and EA, the palpatine 7* event has recomendations of lvl 80, gear 9+, moded toons. But hey its been a year since the last new legendary so it makes total sence to have this event recommend gear 12+, based in what logic I cannot tell you but I'm sure it has to do with greed. I'm by no means a whale but now I may never spend another dime on this game. So congrats on making a customer into a completely F2P-er.